Internationally exhibited and award winning artist Shannon Amidon presents her collection of 50 pieces of artwork created in 50 days for the Sanchez Art Center 50|50 Show. 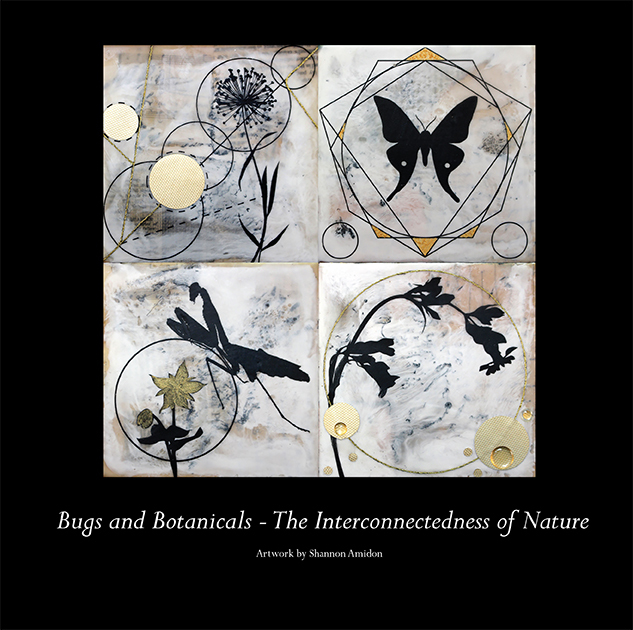 The 8.5 x 8.5 full color, soft cover art book contains beautiful and intriguing imagery exploring her theme of Bugs and Botanicals – The Interconnectedness of Nature. Amidon’s imagery features elements of geometry and symbolism with a variety of insects and botanicals. Each piece was created with the ancient medium of encaustic (molten beeswax) and incorporates a variety of vintage paper ephemera, 23k gold leaf, thread, glass beads and more layered beneath the wax. The paintings are all titled after botanists, naturalists or entomologists, encouraging the viewer to look up the names and learn more about the wonders these scientists contributed to the world.